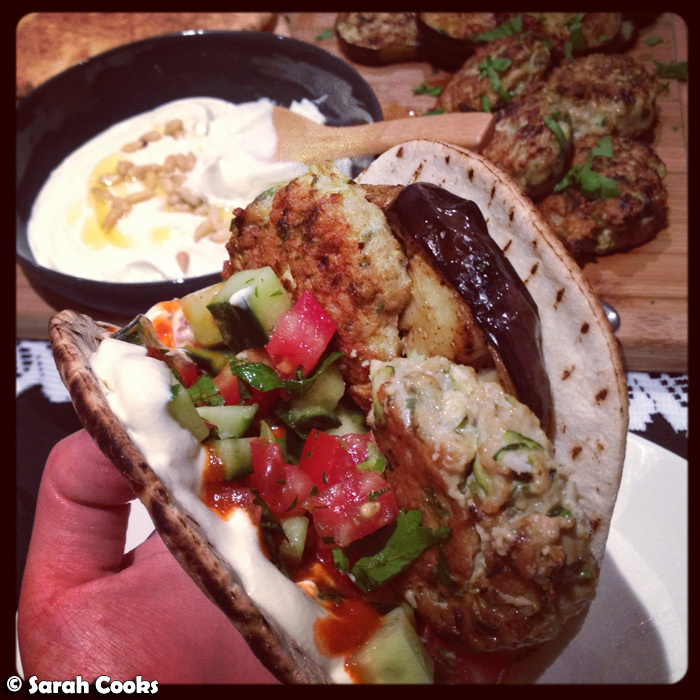 Sarah Cooks: Sarah's Sabih or "The Best Pita Ever!" On Instagram, I've noticed there is a distinct hierarchy of "likes" on my photos. Desserts and sweets are number one, especially if salted caramel is involved. Next comes pork crackling, anything deep-fried, and cafe dishes - with cocktails and any random non-food related pics at the lower end. Lately, I've noticed that some of my casual homecooked dinners get a lot of love (or is that like?) - and with that in mind I thought I might try blogging any meal that gets a lot of likes or comments. This pita, filled with juicy chicken meatballs and creamy tahini sauce, was absolutely delicious and seemed to be pretty popular on my Instagram - and it's the first one I want to share with y'all. (Full recipe below). 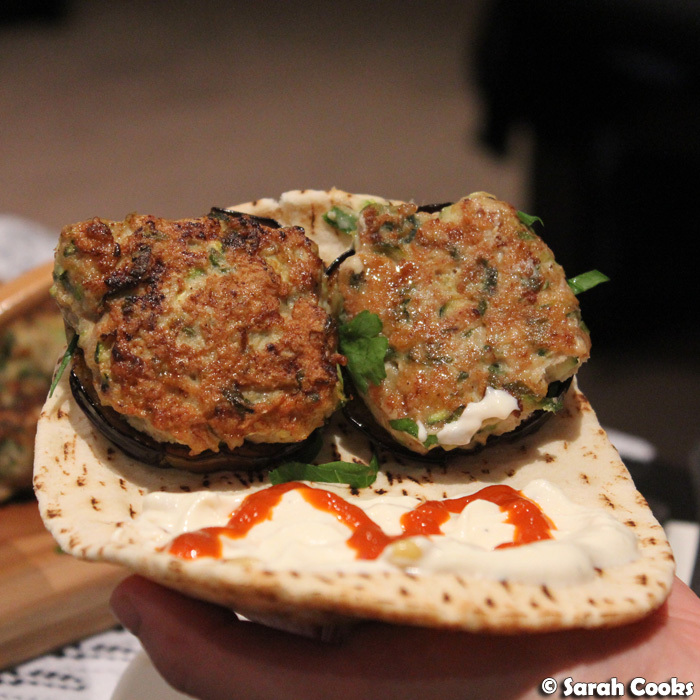 As I've mentioned, I'm totally obsessed with Yotam Ottolenghi and Sami Tamimi's new cookbook: Jerusalem. This particular dinner was a simplified version of their sabih, which I then un-simplified by adding homemade chicken meatballs! 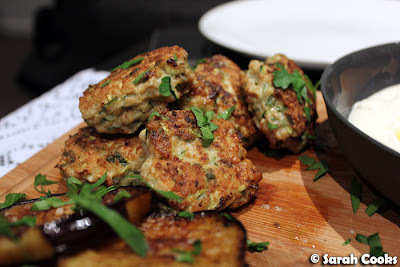 (The meatballs were adapted - barely - from another recipe in Jerusalem: turkey and courgette burgers with spring onions and cumin). So: sabih. 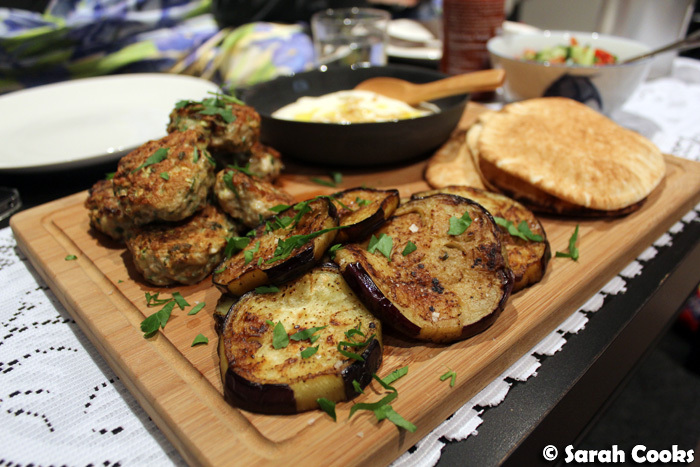 According to the book, sabih, a street food originating in Tel Aviv, is basically a pita filled with a mumbo-jumbo of delicious ingredients: fried eggplant slices, a garlicky tahini sauce, hardboiled eggs, a spicy green chilli sauce called zhoug, mango pickle and a chopped tomato/cucumber salad. Woah! Sounds amazing, right? (Recipes for zhoug and garlicky tahini sauce are included in the book). One day I'll make the full, original version, to see how it tastes - but I must say I was pretty pleased with what I made that night! I kept the fried eggplant and chopped tomato/cucumber salad, omitted the hardboiled eggs and mango pickle, replaced the zhoug with Sriracha, and invented my own garlic-free creamy tahini sauce, with which I was pleasantly surprised - I've made it very frequently since then! (As much as I adore raw garlic in sauces, I don't love inflicting my garlic-breath on people!) And of course, I added the chicken meatballs. I have no idea if it bears any resemblance to anything that would be eaten in Tel Aviv, but it tasted pretty damn good. A note: even though I've said this is a simplified recipe, there's still quite a bit going on here - I'd definitely suggest reading the recipe(s) through a couple of times and planning out your process before starting. It's totally worth it though. One bite into that delicious, juicy pita and all your hard work will be rewarded! For the chopped salad, mix together the tomatoes, cucumber, spring onions, parsley, lemon juice and olive oil and set aside. Trim the base and top of the eggplant, and peel stripes of skin off the eggplants, so that they are stripey. Slice crossways into 1-cm thick slices. Fry in hot oil for a minute or two on each side until golden brown and cooked through. Drain on absorbent paper and set aside. Arrange the chopped salad, fried eggplants, pita breads, Sriracha, meatballs and tahini-yogurt sauce on a large platter or wooden board and allow everyone to assemble them as they like. Preheat the oven to 220C. Mix together all the ingredients, and shape into little burgers / meatball shapes. Heat a thin layer of sunflower oil in a large frying pan. Sear the burgers in the oil until golden brown on all sides. Transfer the meatballs onto an oven tray and cook in the oven for 5-7 minutes, or until cooked through. This sauce is really delicious, and I make it as my preferred accompaniment to any vaguely Middle Eastern-inspired food: kebabs, stuffed eggplants, felafel, whatever. You get the creaminess of the yogurt and sour cream, and the pleasing grittiness of the tahini (a substance to which I am dreadfully addicted), without the acrid, lingering aroma of raw garlic that is so popular in these types of sauces. If you are less sensitive to the feelings of your friends, partners and coworkers than I am, or if you can get them all to eat it with you, I think half a clove of minced raw garlic would make a nice addition. 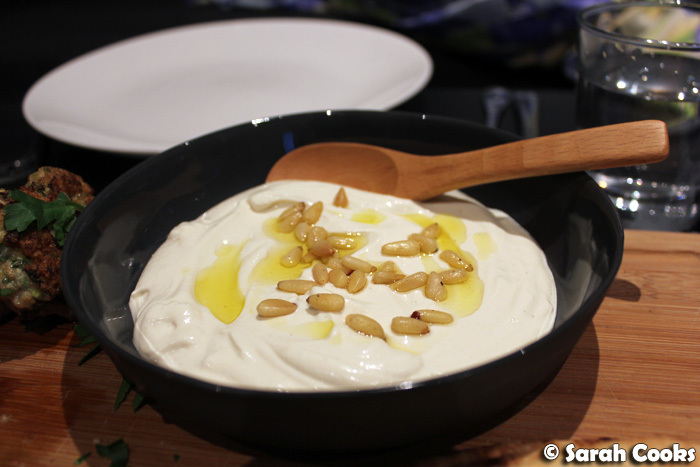 Stir together the yogurt, sour cream and tahini. Squeeze in some lemon juice, drizzle in the olive oil, and sprinkle with salt and pepper. Stir together and taste, adding extra lemon juice, oil, salt and / or pepper if you feel it needs it. Drizzle with olive oil and sprinkle with pine nuts to finish. That looks absolutely amazing and delicious! 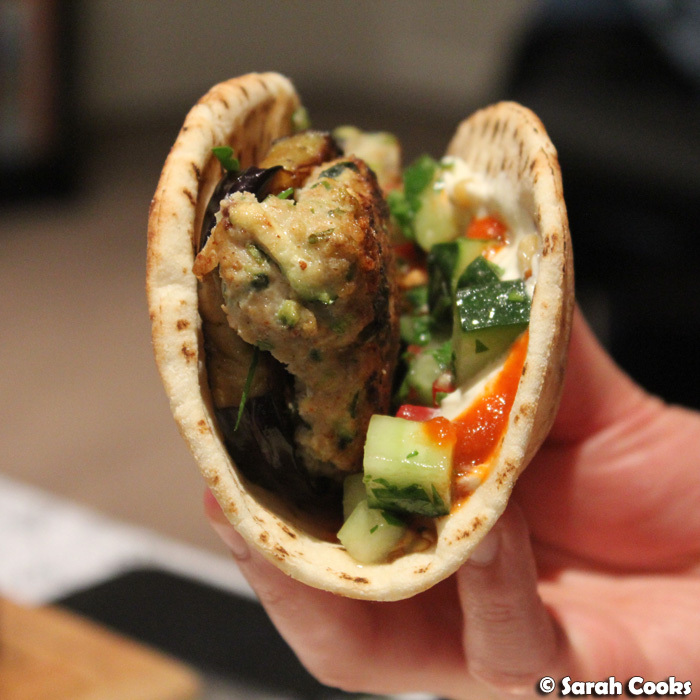 There's a whole lotta flavour going on in that pita! Ottolenghi has great recipes.